The use of book clasps appears to be as old as the codex itself. In its earliest form, which was Coptic bindings, the book clasp consisted of a strap attached to the fore edge of the upper cover and wound around the book over the fore edge several times, the bone attached to the end of the strap being tucked between the strap and the lower cover. Another method, which may actually have been used more often than the strap, consisted of the plaited thong with loops which fit over bone pegs at the edge of the lower cover. Book clasps of this type seems to have been used in England at least as early as the 12th century. The strap was fastened to the fore edge of the upper cover, and the end, which had a metal-rimmed hole, was taken around to the middle of the lower cover and was attached to a metal pin. English book binders of the 14th century began using two straps instead of just one, something which had been done earlier and more often on the Continent of Europe. The hole and pin type was more or less abandoned early in the 14th century and replaced by clasps and catches attached to the fore edge. Initially, each clasp consisted of a strip of leather having a metal hook on one end. Later, the metal part of the clasp was the full thickness of the book and was sometimes attached to the board by means of a metal hinge. In bindings of the 15th and 16th centuries, and probably earlier, the location of the book clasps is a reasonably accurate indication of the country of origin. English and French bindings usually had them attached to the upper cover with the catch on the lower, while bindings of the Netherlands and Germany had the catch on the upper cover. Italian binders often attached the clasp to the upper covers and often used as many as four clasps. The velvet-covered books of the royal collection in England in the 15th and 16th centuries often had ornamental gilt clasps, which were often combined with elaborately ornamented gilt corner pieces and centerpieces which helped prevent abrasion of the velvet. The use of metal clasps began to decline early in the 16th century, probably because they could not be securely attached to the pasteboards which were replacing boards made of wood. The weight, size, and material of the books being published at that time did not require clasps, and clasps were no longer economically feasible for the normal run of books. In most cases they were replaced by Ties . Clasps made of brass were still used in the 16th century for some books which were bound with boards of wood, and silver clasps and corner pieces were often used on small Bibles and other devotional works as late as the late 17th and early 18th centuries. 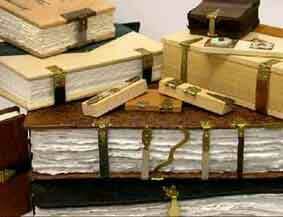 In certain German bindings, however, e.g., Bibles, clasps were used continuously until the end of the 18th century. This was notably true in America, for example, where almost all German-American bindings, e.g., the Saur Bibles, were issued in calfskin over wood with two heavy clasps attached to the lower cover. Brass clasps were revived during the latter part of the 19th century, mainly for Bibles and prayer books, but also for photograph albums, diaries, and the like. They were often attached to metal frames which protected the edges of boards. 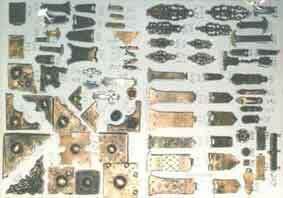 There are very few suppliers of book clasps and related fittings. In Europe; the Muller Bindery in Germany produces certainly the most comprehensive range of reproduction period fittings in the world, here is a picture representative of the range they carry. Most book binders at some stage put their hands to making book clasps themselves, I made the fittings for the book shown on the left, but their is no quick fix when it comes to making clasps like this. It takes time to make clasps like this out of brass and cut with a jewelers saw and small files. The thongs are made from alum tawed leather, backed with vellum to prevent stretching and give extra strength. These clasps are a pleasure to make, I used silver wire hammered flat and plaited with vellum, they should prove to be extremely durable. Please note there is a free tutorial available from this site which shows you in detail how to make a set of silver book clasps like these. In the USA Joycelyn Merchant is also making book clasps. After a 25 year career as a jewelry designer and metal smith she became interested in the Book Arts. She now teaches classes and gives a workshop on making metal book clasps in which she teaches bookbinding students enough simple metal working techniques to enable them to easily make their own clasps using readily available tools and materials.